I have wanted to make this recipe for “Blarney Stones” a.k.a. 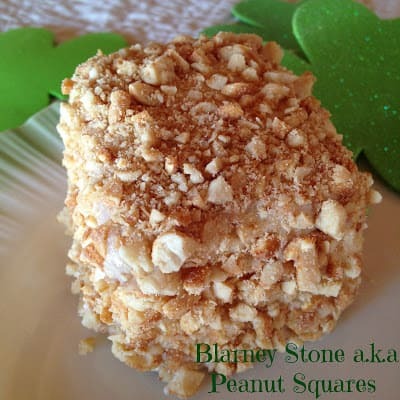 Peanut Squares since the first time I saw the recipe in a Taste of Home Annual Cookbook. That was back in 2003. Better late than never! 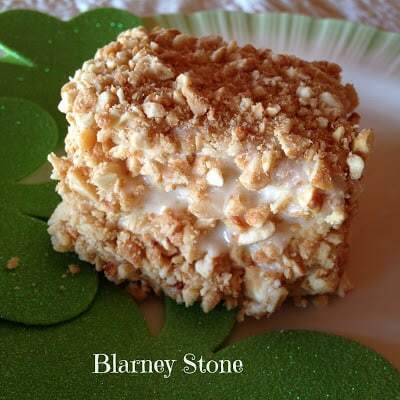 Where is the Blarney Stone and How do you kiss it? 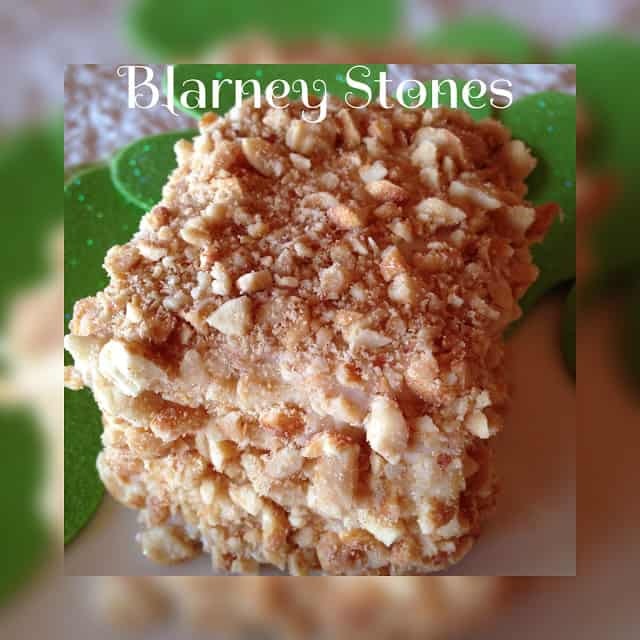 How to Kiss a Blarney Stone…..
Picture above: The Blarney Stone at Blarney Castle in Ireland. After doing some research on the Blarney Stone and after watching a few videos on where the Blarney Stone is located and after learning how you have to go about ‘kissing’ the stone I can say without hesitation..Hell No to That! Let me back up here, I would love to visit Ireland, the Emerald Is someday. With it’s rocky coastline, lush green countryside and folklore, it’s both a beautiful and magical place. looking backwards, kiss a rock/stone…. (while some complete stranger held on to my feet/legs)….I’m pretty sure I can do that…But the clincher here.. The famous Blarney Stone is located at the top of the Blarney Castle, I mean at the very top (Check out the video) and I’m deathly afraid of heights…..
dizzy, disorientated fear, stuck-in-place fear. That being said my chances of ever kissing the Blarney Stone are pretty slim to none…and I’m ok with that. I’ll leave the kissing of the stone to my husband, who isn’t afraid of heights, while I stand on the ground and wave up to him. What’s the purpose of kissing the Blarney Stone? The purpose of kissing the “Blarney Stone” is to gain the gift of eloquence. Which means to speak and or write with “eloquence.” In the Irish culture this holds a lot of significance. It’s said to help you in telling a story or tale, depending on how you look at it I just. 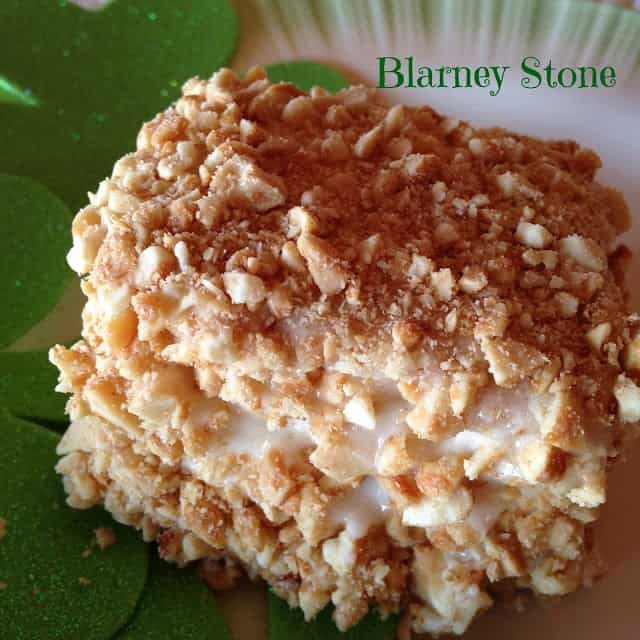 With all that being said, I will stick to making these “Blarney Stones” a.k.a. 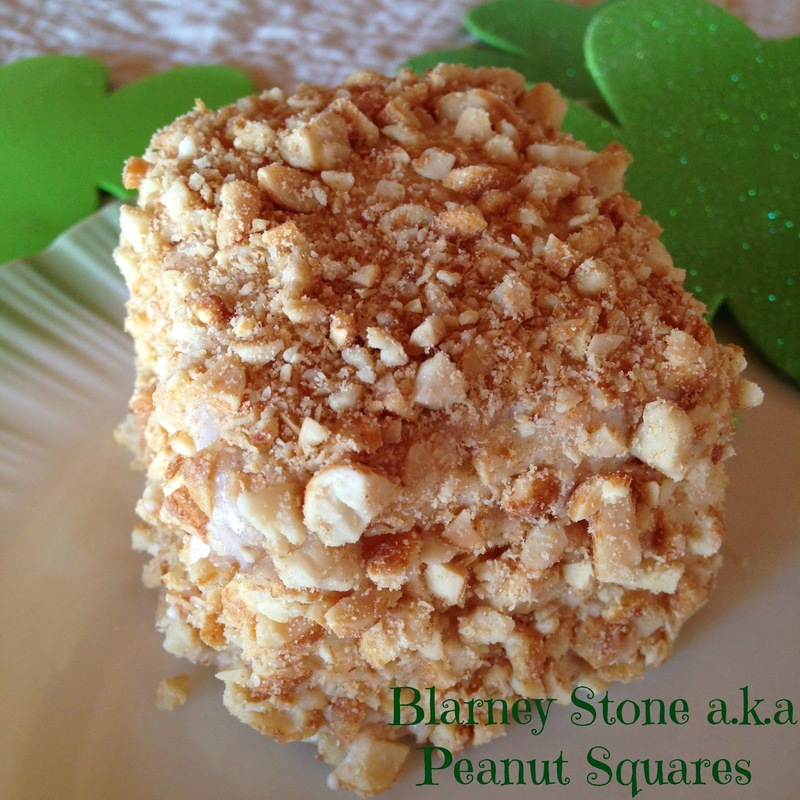 “Peanut Squares” while I have both feet planted firmly on the ground. 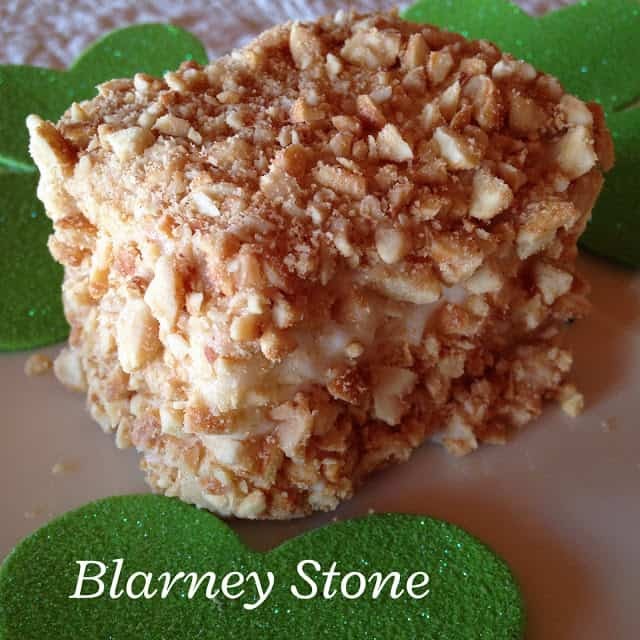 With one bite of these delicious ‘Blarney Stones’, you’ll be kissing these stones instead. That’s how good they are. For over 200 years, world statesman, literary giants, and legends of the silver screen have joined millions of pilgrims climbing the steps to kiss the Blarney Stone and gain the gift of eloquence. Its powers are unquestioned but its story still creates debate. In a mixing bowl, beat the eggs, sugar and vanilla until thick and lemon-colored, about 4 minutes. Combine the flour, baking powder and salt; add to the egg mixture. Beat on low speed just until combined. Add the milk and butter; mix well. Pour into a greased 13 x 9 inch baking pan. Bake at 350º for 30 to 35 minutes or until a toothpick inserted near the center comes out clean. Cool on a wire rack. Cut into squares. Cover and freeze overnight. In a mixing bowl, combine confectioners’ sugar, milk, vanilla and salt; beat until smooth. 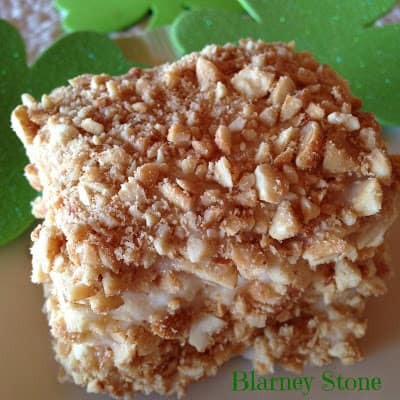 Frost the top and sides of frozen cake squares; roll in chopped peanuts. Place on wire racks to dry. used to make these years ago and I have not had one since!! These look seriously delicious. As I am allergic to both food colouring and chocolate there are not many sweet treats I can eat. 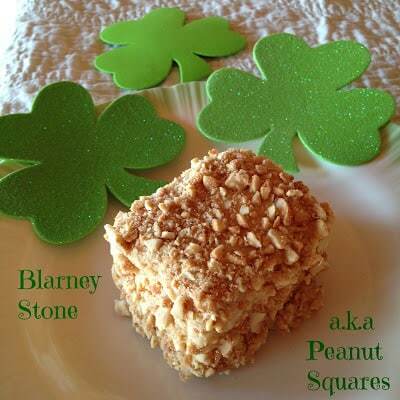 I’m so glad your going to try these Blarney Stones! They are a bit to make but well worth it.